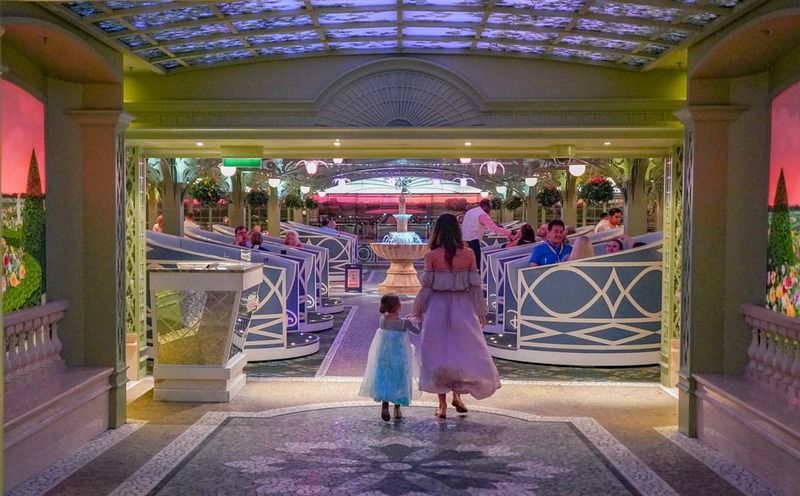 While many of the experiences on a Disney Cruise ship are included in the cost of the voyage, many things are additional. Here’s where your money will be well spent. 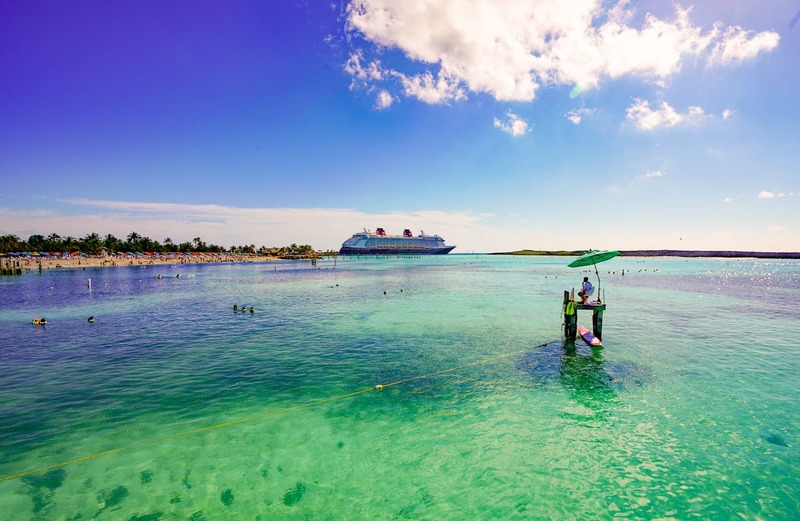 Castaway Cay is Disney’s private island beach stop in the Bahamas. 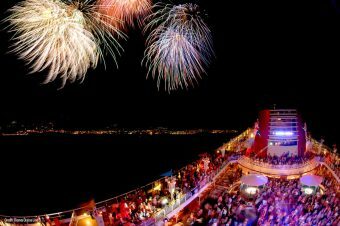 The Disney Dream is often the maiden voyage for many on Disney Cruise Line. It departs from Port Canaveral, only 45 minutes from Orlando, and sails three and four days cruises to the Bahamas. Passengers often include a stay in Orlando before or after the cruise at the Walt Disney World Resort. Some splurges are several hundred dollars like the Castaway Cabanas. The Disney Dream and its sister ship the Disney Fantasy are the newer ships of the fleet that includes the Magic and the Wonder. There are new Disney ships coming, however, but little information has been shared yet about them other than they are a bit larger than the Dream and Fantasy. Splurges like the Rainforest Pass can be had for less than $20. 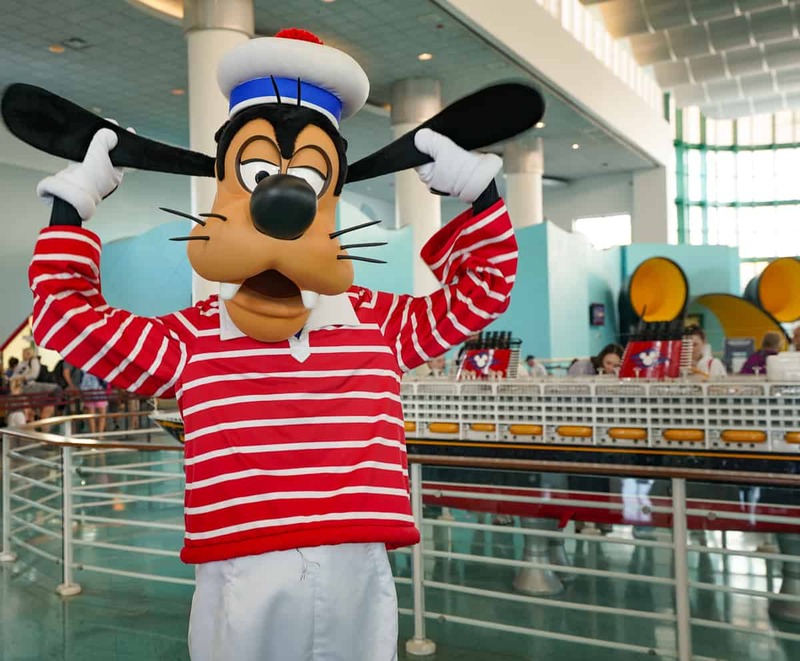 What’s included in a Disney Cruise? 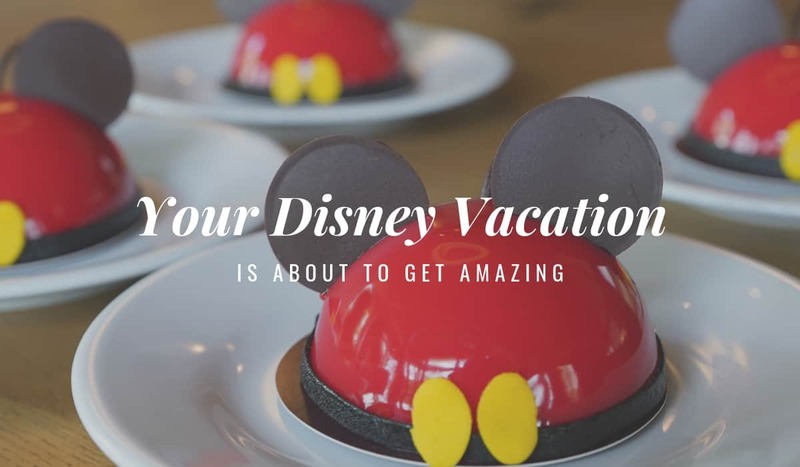 All standard meals, childcare, meet and greets with Disney characters, shows, and entertainment are included in the price of a cruise. Fortunately, there are so many activities offered, families can keep busy without paying for extra experiences to have a great time. But there are several ways to upgrade your Disney Cruise that come with fees, both a little or a lot. Better coffee, excellent spa treatments, and outstanding dining await. 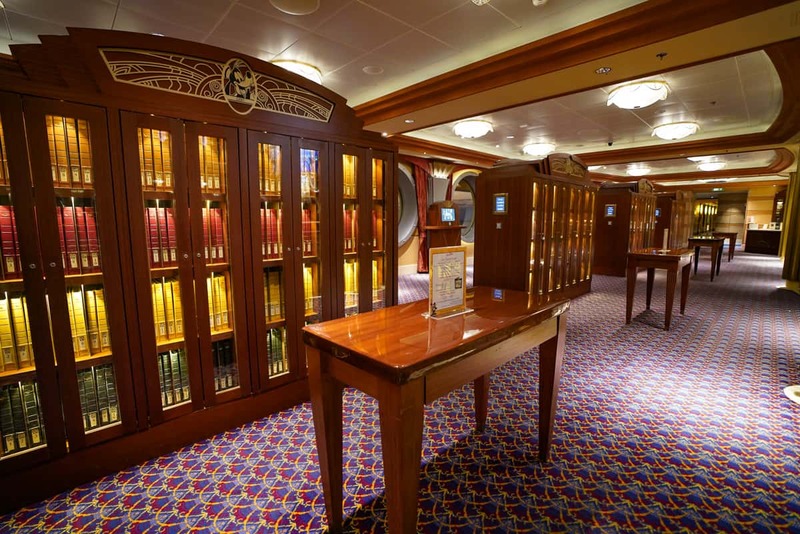 While these experiences are based on the Dream, many are relevant for the entire Disney Cruise fleet. 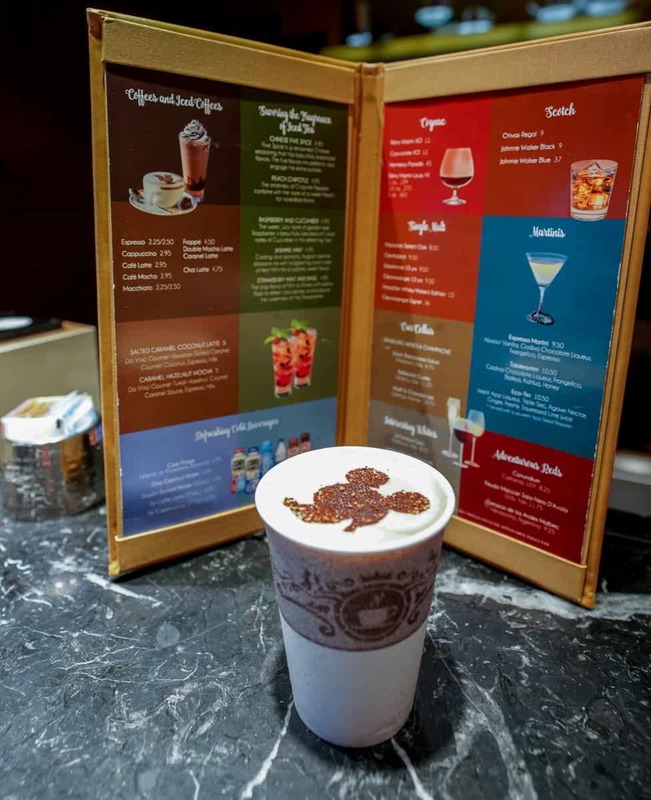 There are many ways to enjoy Disney Cruise Line’s premium food and beverage experiences. Well, the first serious splurge is to decide if you want to sail Concierge level. Whether or not sailing Concierge is “worth it” is a loaded question with an article devoted to answering it. Concierge perks begin before the cruise—120 days to be exact. Concierge guests have first dibs on all cruise experiences when they can send requests at 125 days before sailing. 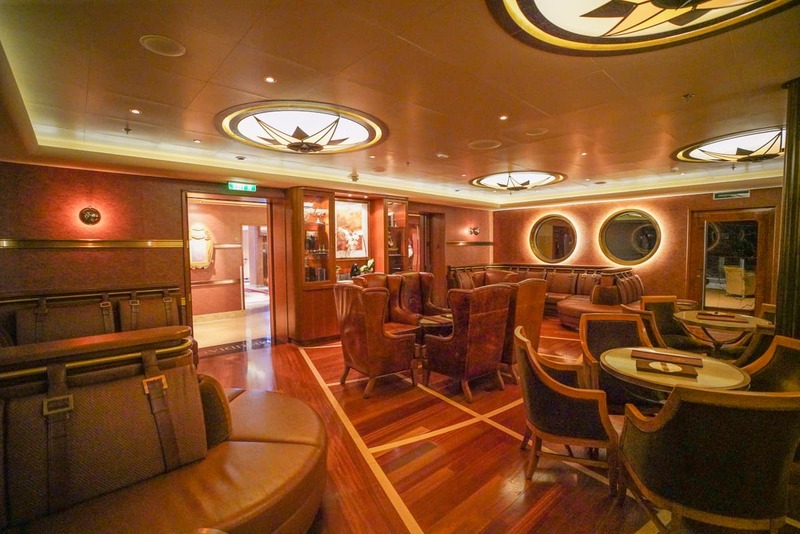 They also enjoy a more VIP embarkation area. While the price increase is significant, some of the perks are included. I’ll note those when they are or when the concierge experience makes other extras redundant. Concierge staterooms are furnished differently with enhanced decor. 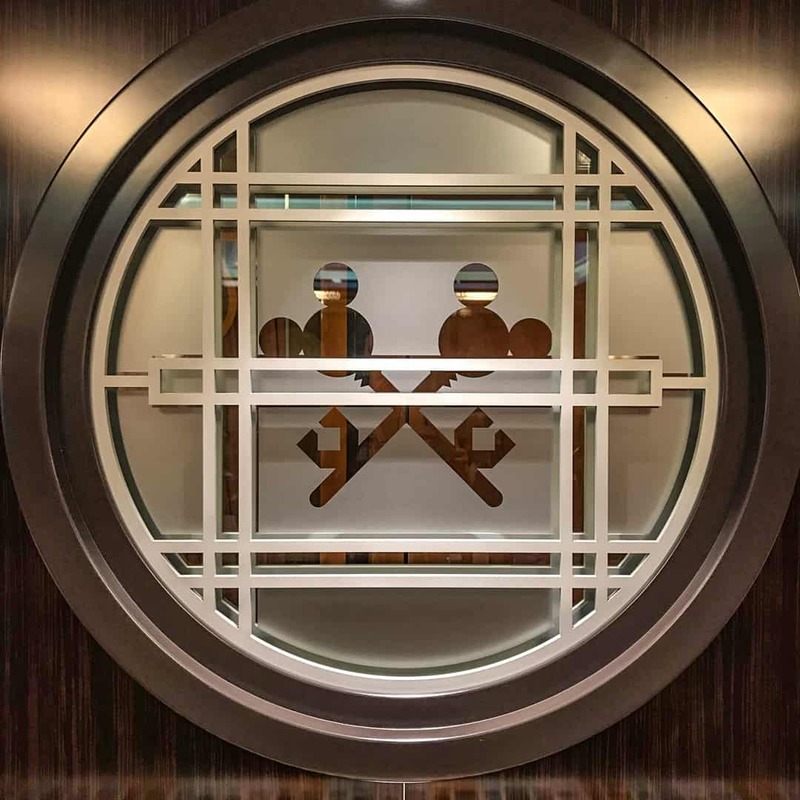 The most obvious perks of sailing concierge include expedited, priority boarding to maximize time on the ship on embarkation day, enhanced staterooms and suites, and access to the Concierge lounge and hosts. The lounge provides food displays all day long and alcoholic beverages during certain extended cocktail hours each day. Guests can make do with a hearty continental breakfast from the lounge and skip the main dining rooms if they choose. The hosts are able to book experiences or get tickets to character meet and greets, too. 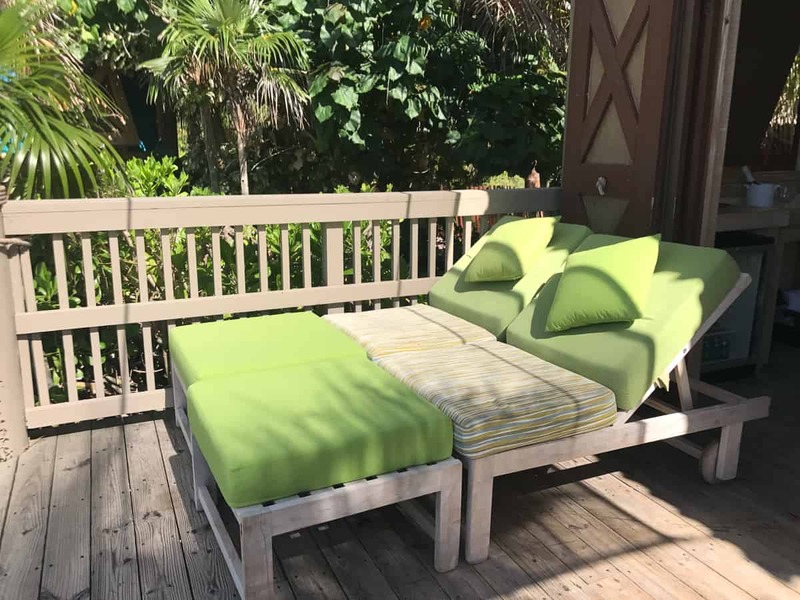 Other key perks include a Concierge-only hot tub and relaxation area off of the lounge as well as first access to limited experiences like Castaway Cay cabanas (discussed later). Cost: An upcharge of starting at $1800 for a three-day cruise, and often more than double the price of a longer cruise. Many families find booking two adjacent rooms to be even better than a one bedroom suite for significantly less, especially on longer cruises. Cost: Double what you are paying. 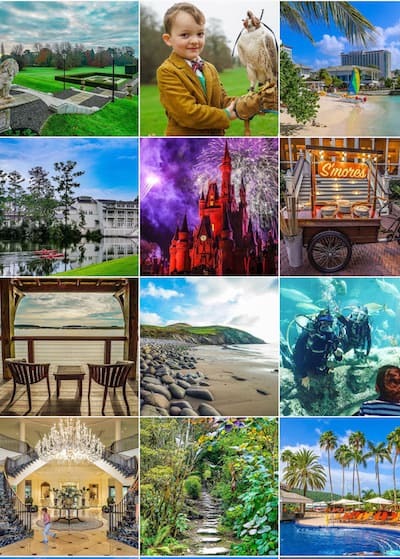 expert answers for all of your Disney travel questions. It’s super fun to walk in to your stateroom and find treats waiting for you. These Disney Cruise Line gifts cannot be ordered online. One has to call guest services. 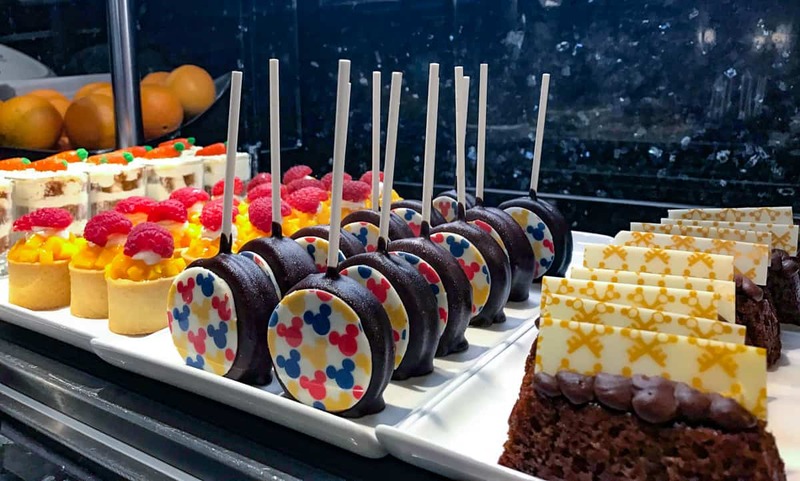 We have enjoyed the fruit platter, cheese platter with nuts, crackers, and fresh honeycomb, and chocolate covered strawberries. It’s fun to pre-order stateroom gifts. Bring aboard some mini Prosecco bottles for an instant party while you unpack. There are also room decor packages for celebrations, spa sets with robes, packs of water, beer, or wine, too. 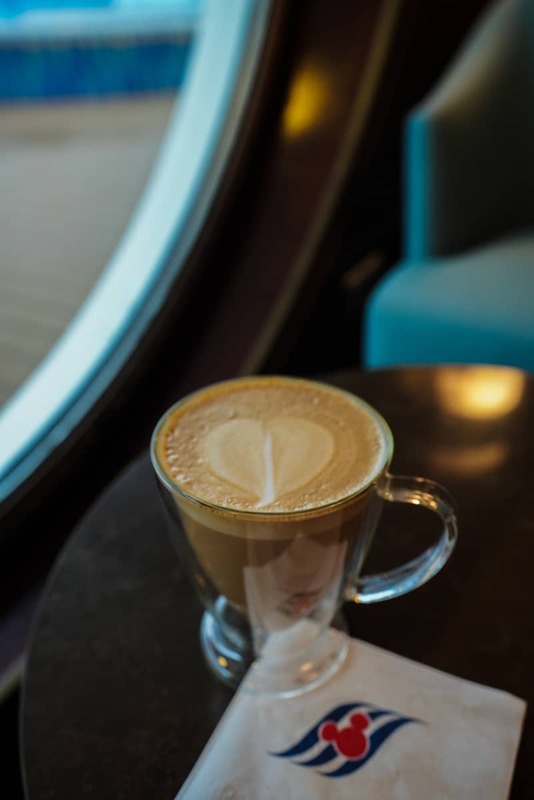 Concierge guests do not need to do these as guests have access to the Concierge lounge from the moment they board the ship with complimentary food, high-end coffee, and alcoholic beverages. Concierge guests can request that their hosts stock their stateroom mini fridge with the soft drinks, beer, and waters of their choice, too. 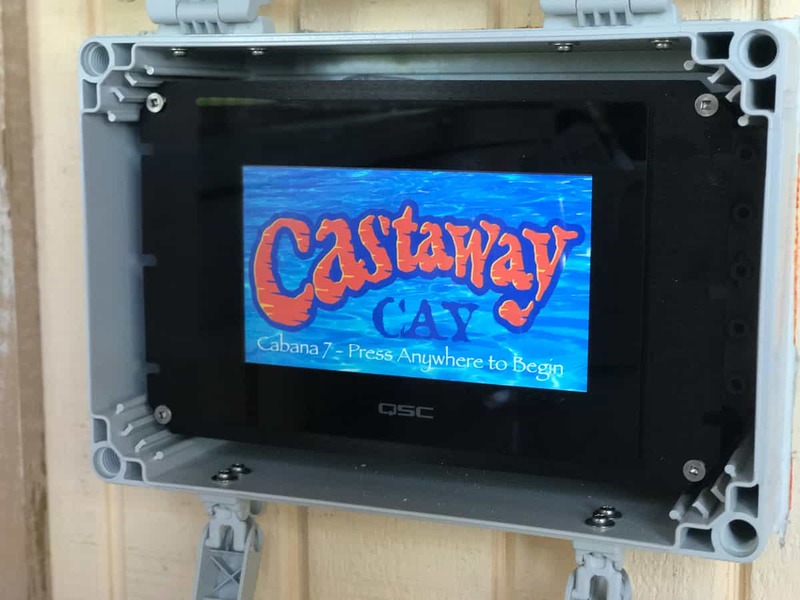 Fish extenders are the metal clipboards that cast members affix messages and reservations to passengers next to their cabin door. 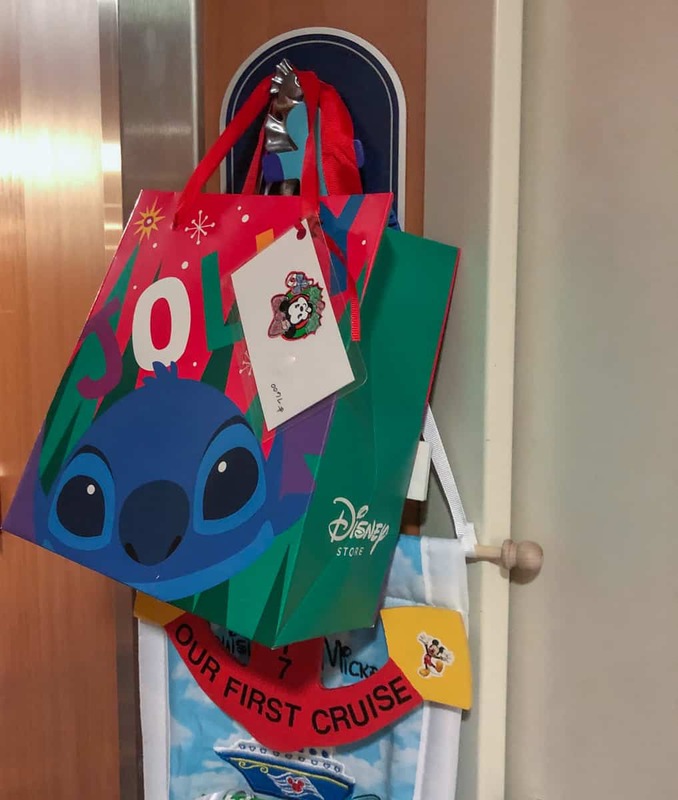 Over time in Disney culture, guests began organizing “fish extender” gift exchanges that I’ve written about more extensively in this article. They are a lot of work, and they can add up and be costly. 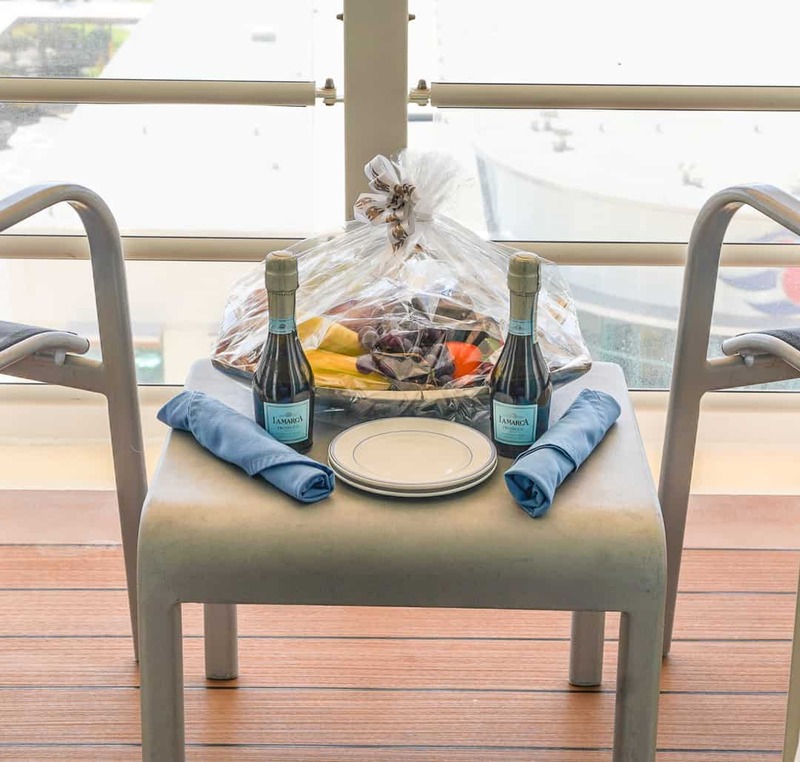 It is thrilling to return to your stateroom from a meal and see beautiful bags from other passengers waiting for you and your family. The idea isn’t to run to a dollar store and buy lots of Disney swag and create the least expensive gifts that one can. Some people simply love the gift making and get very creative. With up to 20 people in a group, the costs can add up if you budget $10 per cabin. It’s not unheard of for people to spend $20 per cabin. 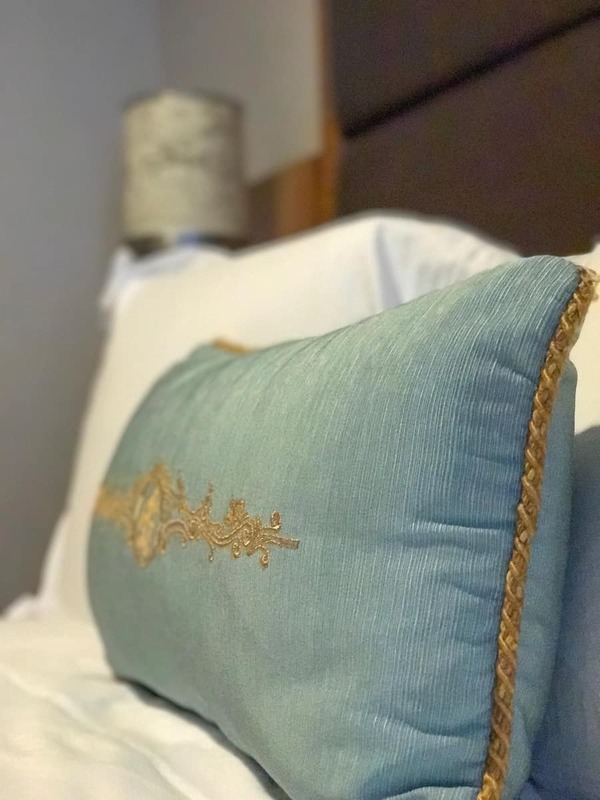 It is thrilling to return to your stateroom from a meal and see beautiful bags from other passengers waiting for you and your family. It’s worth doing at least once. My children enjoy delivering gifts to the stateroom while I am unpacking our luggage on Embarkation Day. Cost $150 and up to participate. Check out our Disney Cruise Store of Essentials on Amazon. 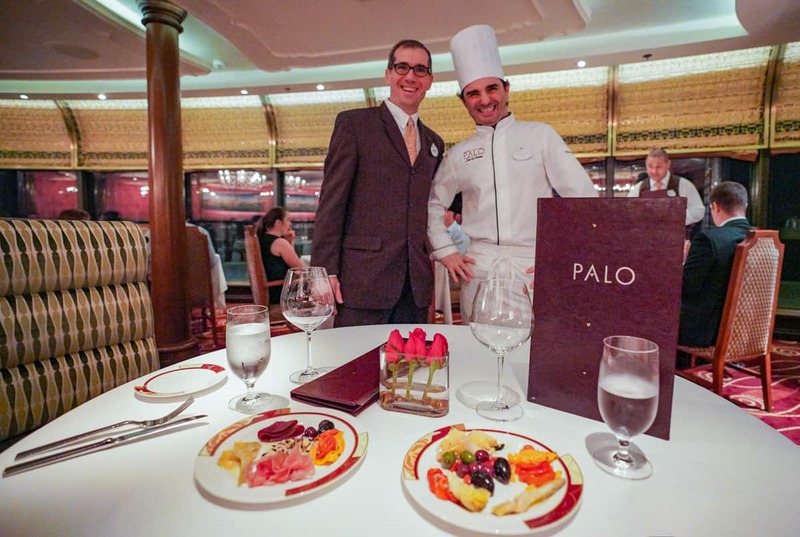 Palo is the Italian restaurant available for adults only as a premium dining experience for a supplemental fee. And it’s a tremendous bargain for the experience you receive. 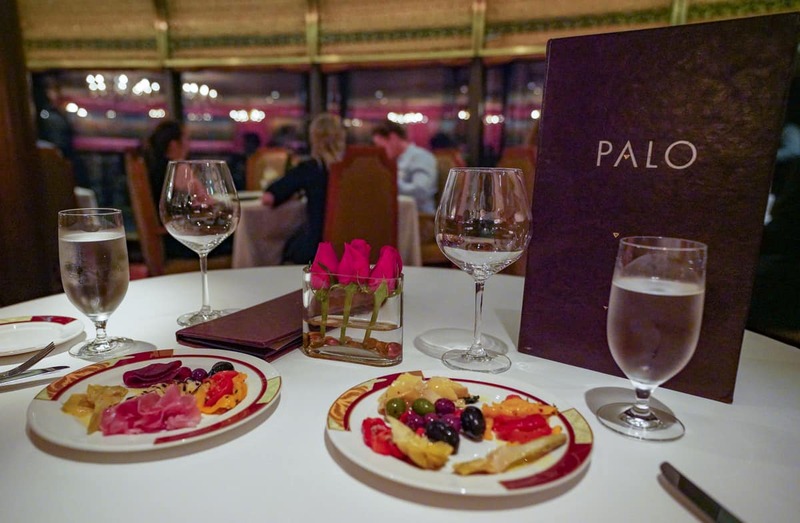 Palo offers a wonderful Italian menu starting with antipasto. For dinner, we’ve enjoyed that they have accommodated special dietary requests. The chef once improvised a vegan mushroom pasta, or the kitchen has a delicious gluten-free alternative for most pasta dishes. The lobster pappardelle is the fantasy dish you wish you could eat every day. The chef came out and made pastas for our special diets with a smile. Many passengers love Palo’s brunch. It’s quite different from the dinner experience, as there’s a large buffet in addition to menu courses. Even if you’ve booked a dinner it won’t feel like the same booking a brunch, too. The Dover Sole prepared tableside by Uri our server. Cost: $40 per adult for brunch or dinner. 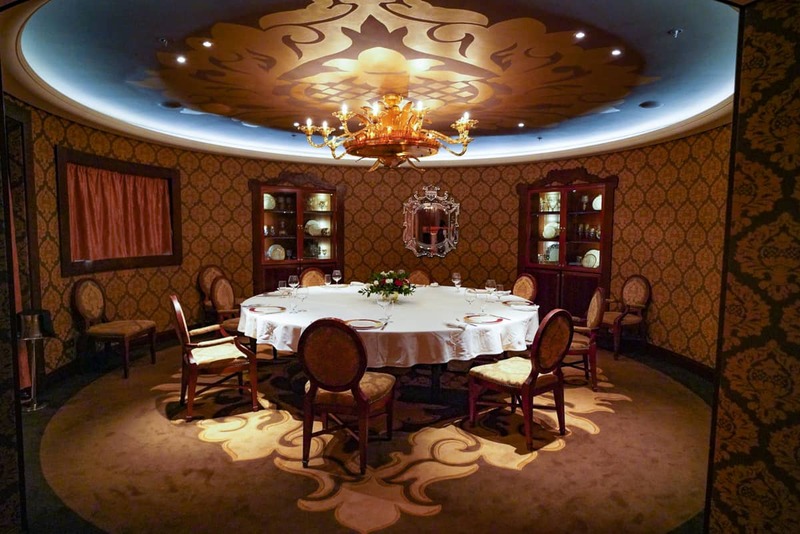 Palo has a beautiful private dining room if you have eight people ready to gather to dine (on the Dream or Fantasy and 10 on the Magic or Wonder). This additional personal space is complimentary and available on a first come first served basis for either a dinner seating at 6PM or 9 PM. Palo’s private dining rooms is perfect for a large gathering of friends. Cost: No additional fee beyond the fee to dine at Palo. 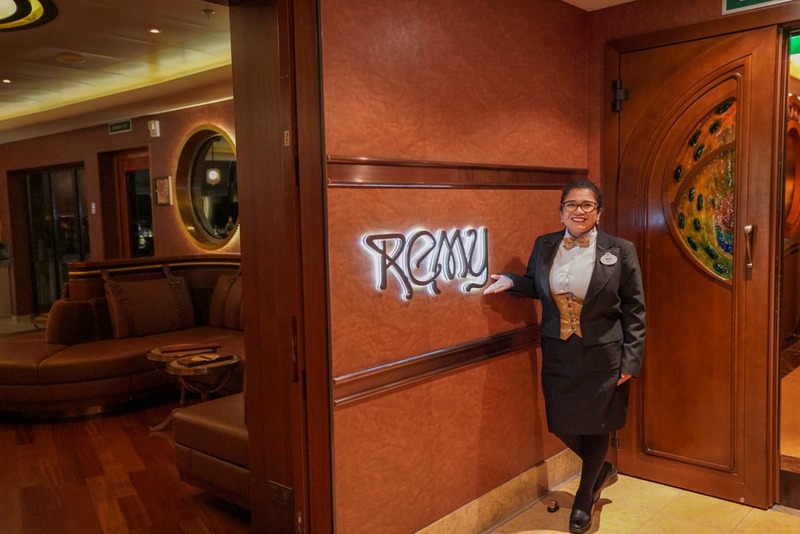 Remy is the French-influenced restaurant on the 12th deck named after the character in Ratatouille. 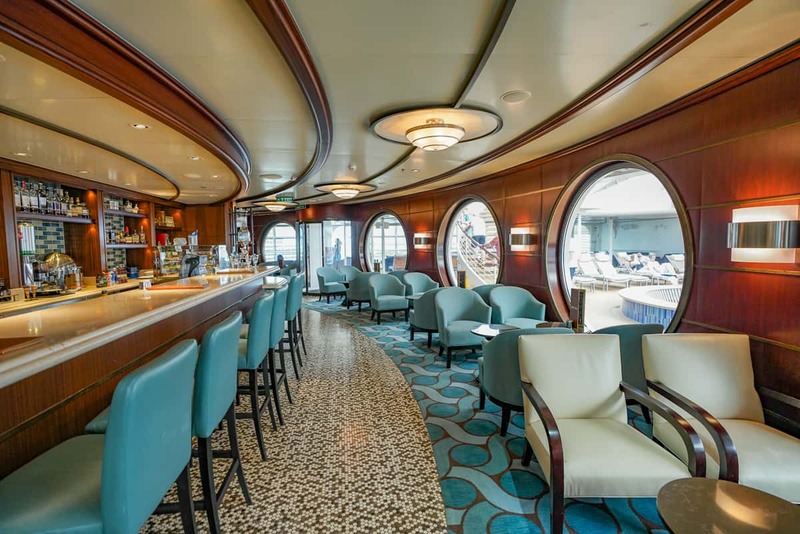 This premier dining option only on the Disney Dream and Fantasy. 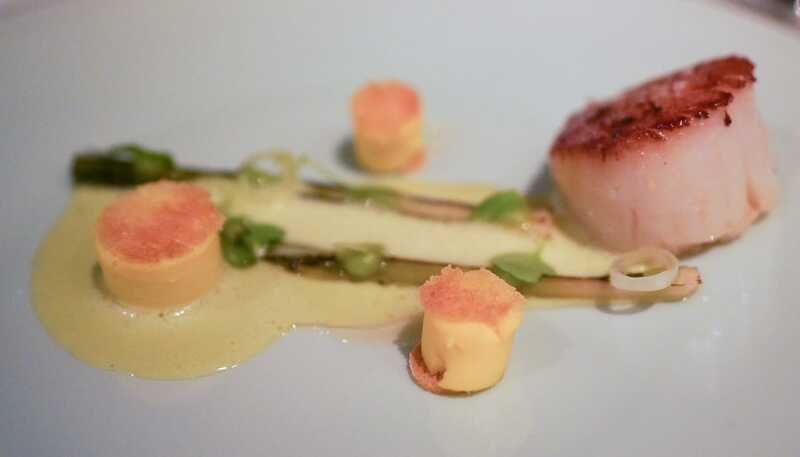 Remy offers a gastronomic multi-course tasting menu for dinner. 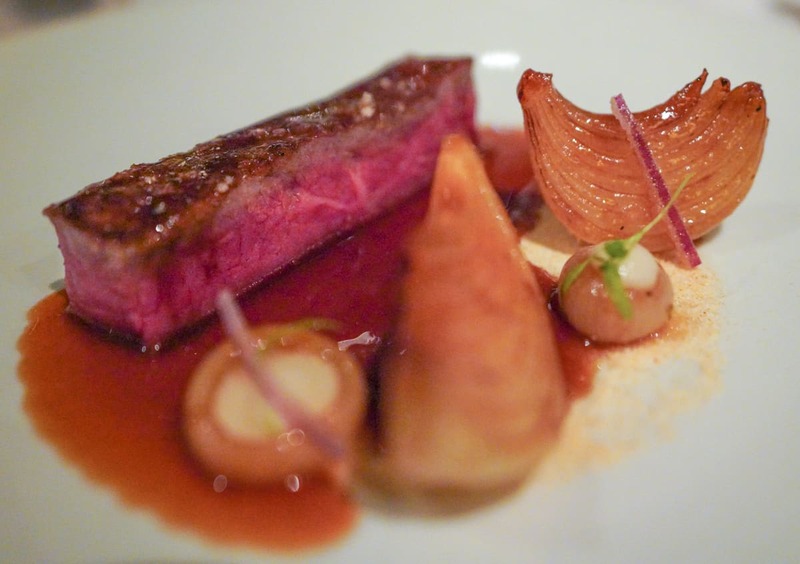 For dinner, guests can choose either a French or American tasting menu. We always choose one of each to have a chance to see what the kitchen can do. 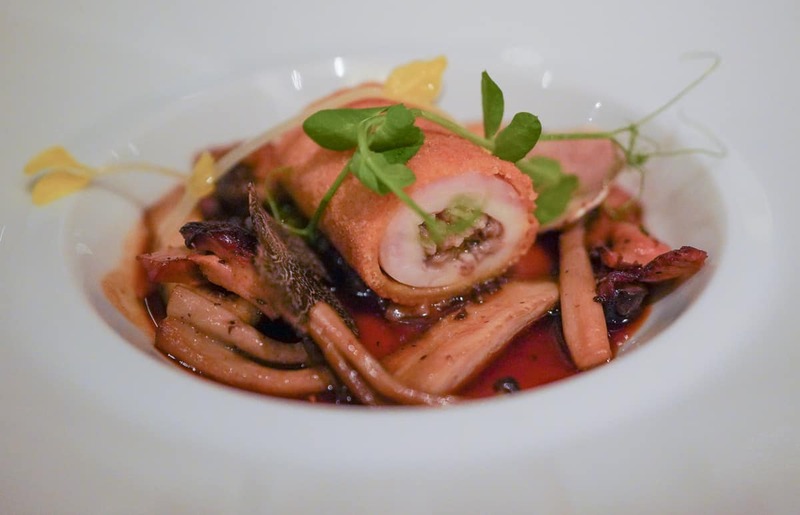 The French menu is authentically gastronomic and not for those American diners seeking familiar ingredients and textures. 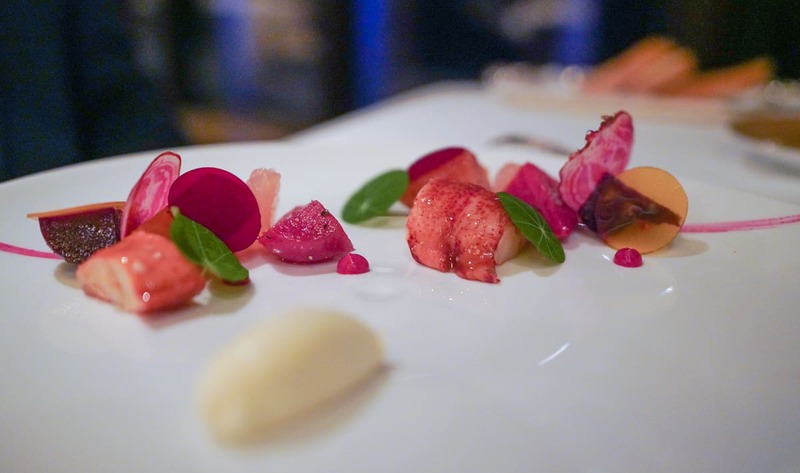 If things like lobster jelly entice you, go for it. I did. Both tasting menus will have several courses that will knock it out of the park, and dessert courses keep coming until you cry mercy. The service at Remy is outstanding. Both times, our servers have been French speakers adding to the charm and formality of the meal. Occasionally, Remy’s experience can veer into Pépé le Peu territory to manufacture romance. Our server presented me with a rose and created a back story of my husband calling in advance to request it. He winced and smiled at the same time. This surprise rose ceremony felt more fake and forced than a Bachelor season finale. Cost: Its supplementary fee costs $125 per passenger for dinner and $75 per person for brunch. While so many people rave about Animator’s Palette, I can’t say I am a fan. I do love the Enchanted Garden because I feel like I enter an animated oasis like Mary Poppins. Enchanted Garden on the Disney Dream feels like my inner seven year old designed a restaurant. The restaurant has tea cup booths that face the main thoroughfare in the restaurant that are given to parties of four. We were delighted to have received our seating at these where we enjoyed a few meals. If you are a party of four, check with guest services prior to boarding to request one, and you might get lucky! Concierge guests can request premium seating as a perk from their hosts. Cost: Free and a little bit of luck. 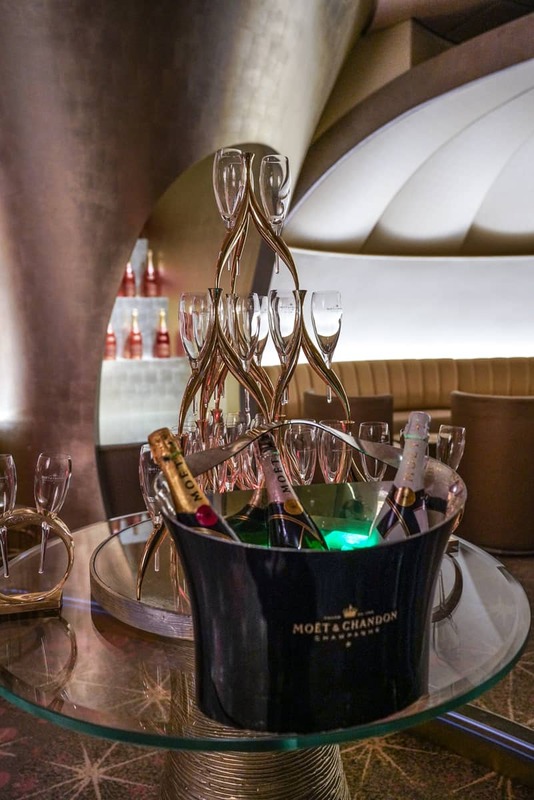 The Champagne Tasting by Moet Chandon is a wonderful way to spend a late afternoon. 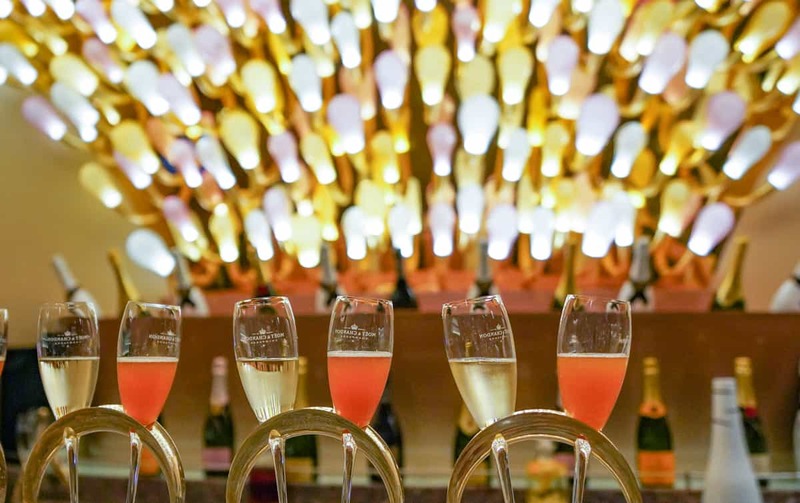 The tasting occurs in the beautiful Pink Champagne Bar. Guests enjoy several flutes of four different varieties: Demi-sec, Brut, Extra Brut, and Moet Ice. The experience included an informational session about the méthode champenoise as well as the background on the varieties we sampled. The other tastings have a similar format with three to four samples to try. 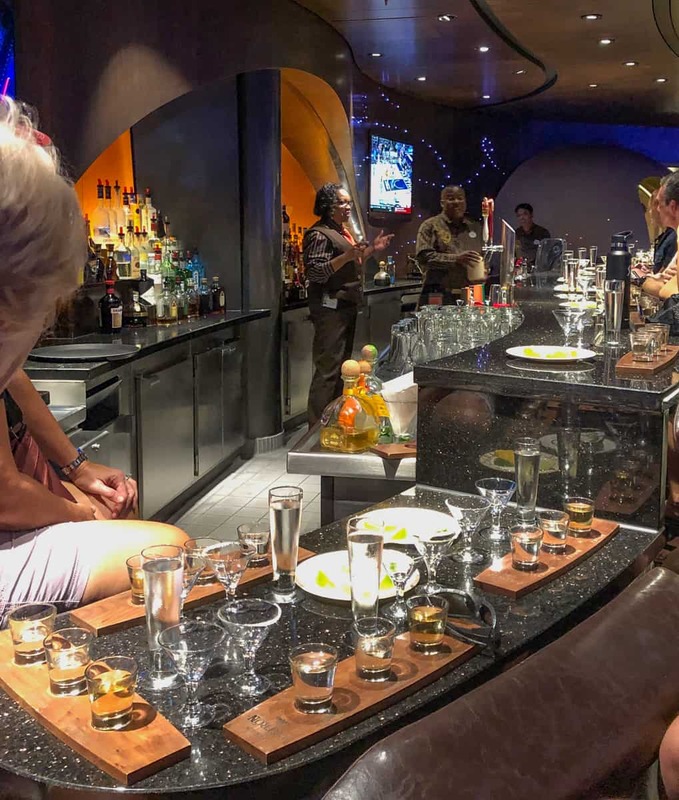 There are several options from bourbon to beer, tequila, and whiskey tastings, and a selection will be offered on your cruise. Cost: Tastings range from $23 for rum to $38 for Champagne. Mixology is a slightly different format where guests create intricate cocktails throughout their seminar while ingredients have already been pre measured, sliced, or muddled. Mixing is all that is required. This class is super popular and should be booked as soon as possible. I attended a similar class at the Disney Vacation Club lounge at the Wilderness Lodge and easily saw its appeal. Cost $25 per person for Mixology. Many passengers get into the spirit of Pirate Night. Several adults get really dressed up in addition to the children. In fact, they seem to be having more fun in their costumes. 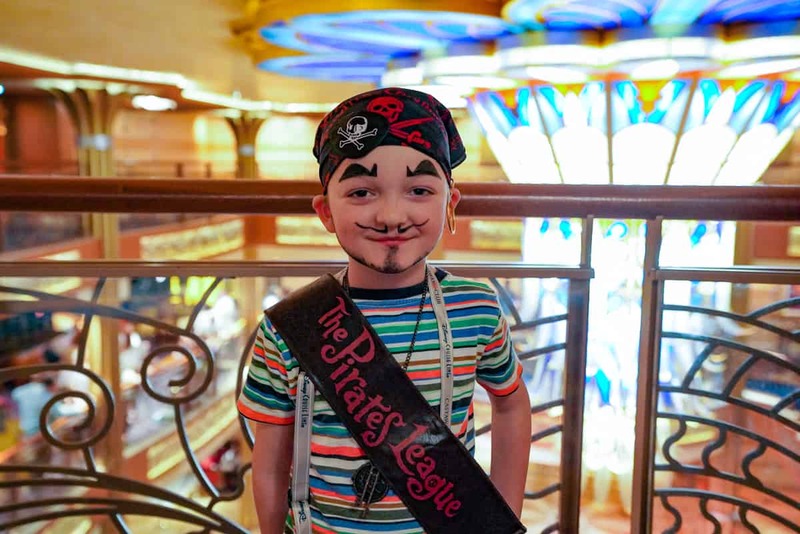 If you didn’t pack a costume, the Pirate League has you covered. I booked my son the First Mate Package at Bibbidi Bobbidi Boutique. Gone is anything sweet and royal. 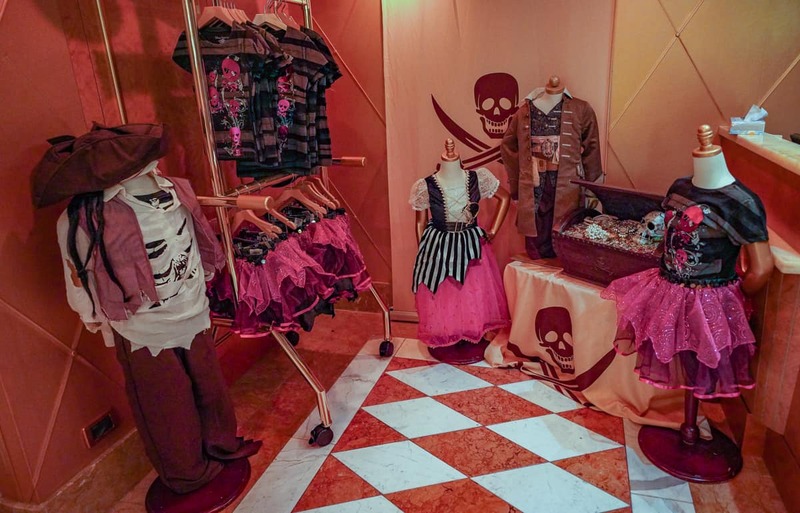 The legendary princess makeover factory transforms into a swashbuckler haven on the day of Pirate Night. Red lighting, skull decorations, and an entry filled with pirate costumes welcome guests. The pirate makeover was entertaining and delighted my son. 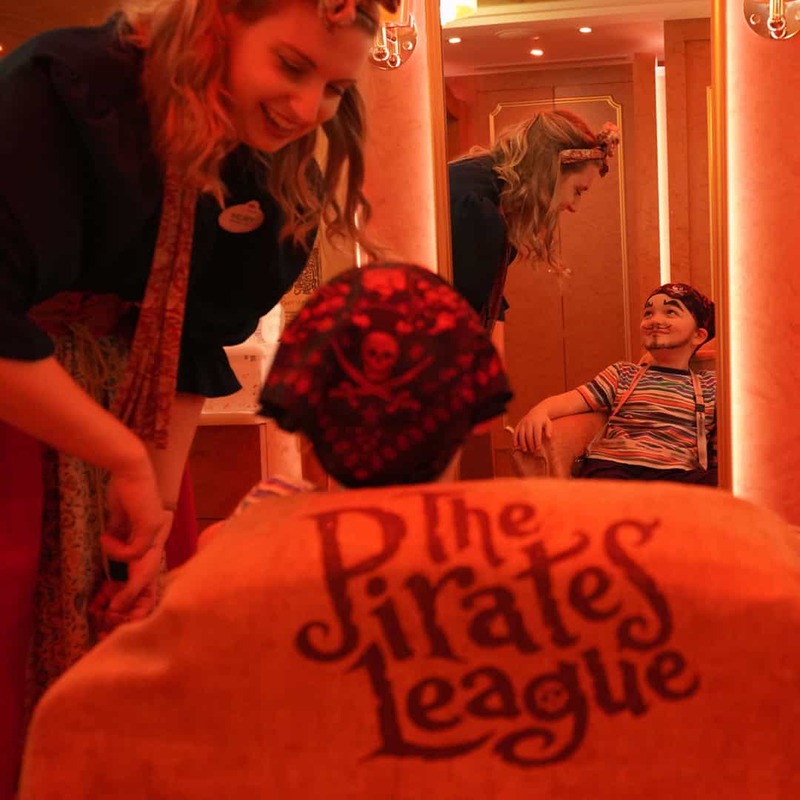 The staff play up the naughtiness and crazy fun of the pirate spirit barking orders and teasing the kids in a playful way. My son was fixated. After the transformation, children swear an oath of piracy and walk the ship with a menacing smile. Here’s a word of warning. 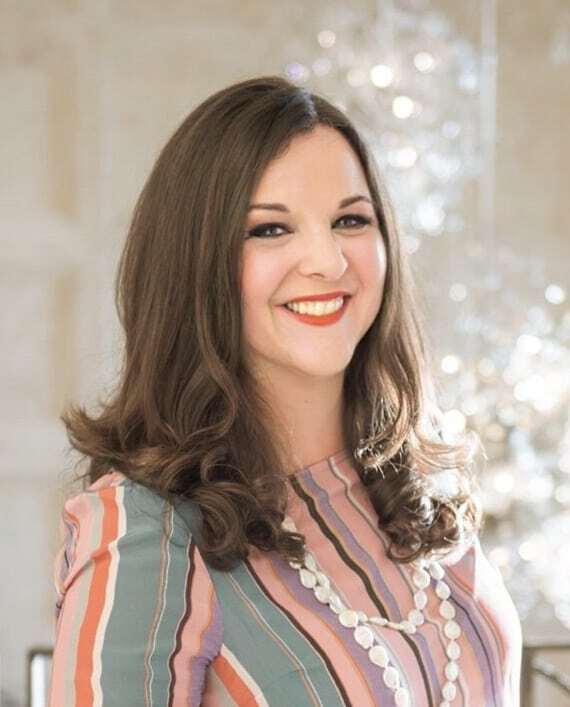 Many parents know that a little pixie dust during a princess makeover means that glitter will be in your child’s scalp until they graduate middle school. My son’s pirate make up came off except for the eyebrows which lasted several days. 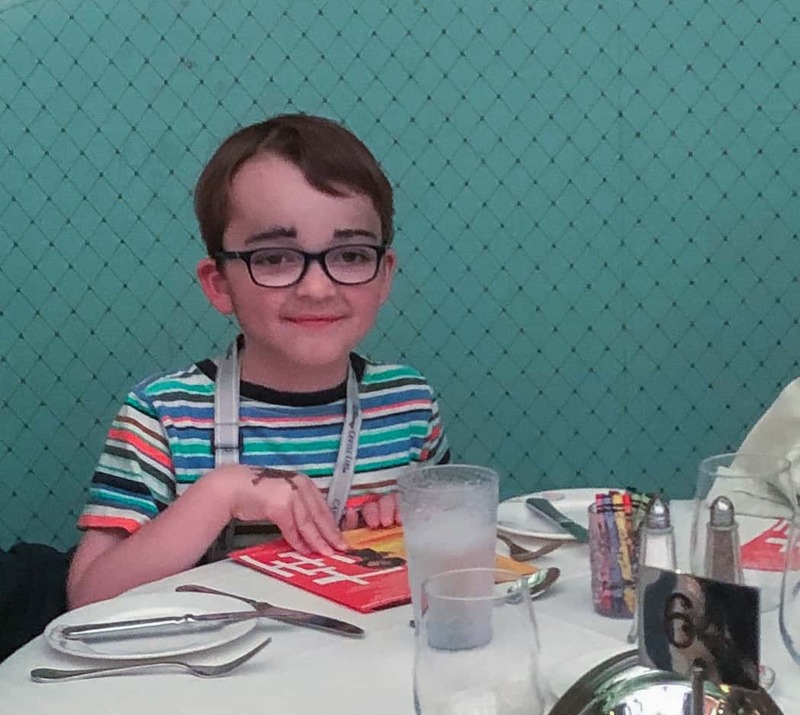 Fortunately, he didn’t care much that he had to go to school looking like Groucho Marx. Cost: $44.95 for a 30-minute makeover that includes pirate face make up, a sword, bandanna, pirate jewelry, and tattoos. 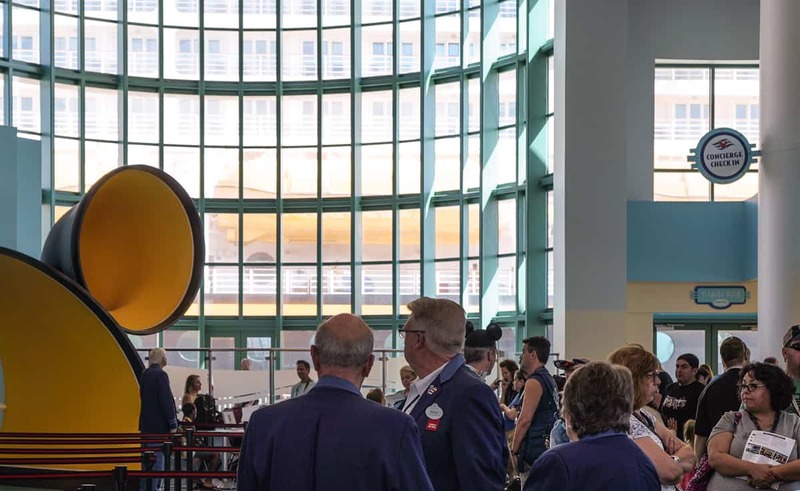 Similar to the memory maker packages offered at Disney World, cruise passengers can elect to purchase photos in advance. 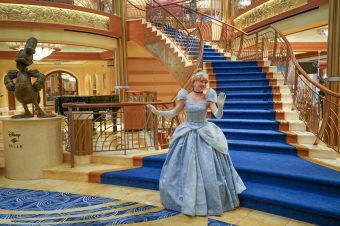 Photographers welcome passengers as they board the ship, throughout evening meals, and usually a character appearances. If you’re big into family photos like this, then you should book an unlimited package to purchase in advance of your cruise. It’s important to make a commitment to get in front of those photographers to make the pictures and this purchase worth it. Shutters is the photo library guests can view their vacation shots. I’ll be honest, after seeing the photographers on our embarkation day, I don’t really see them. They’re just not in the parts of the ships we tend to be. Had I purchased a package, I would’ve been disappointed that I did not get my money’s worth. If you are willing to queue for photos with characters, the photo package is worth it. If you have little ones who want to meet a lot of the characters, that’s when the package may make the most sense where photographers are readily available. The up charge from 10 photos in a package to an unlimited photo package is $50. So I’d recommend purchasing the photos a la cart if you think they will only be a few, or splurge for the whole package. Cost: They offer both digital and print packages with all images for $199. 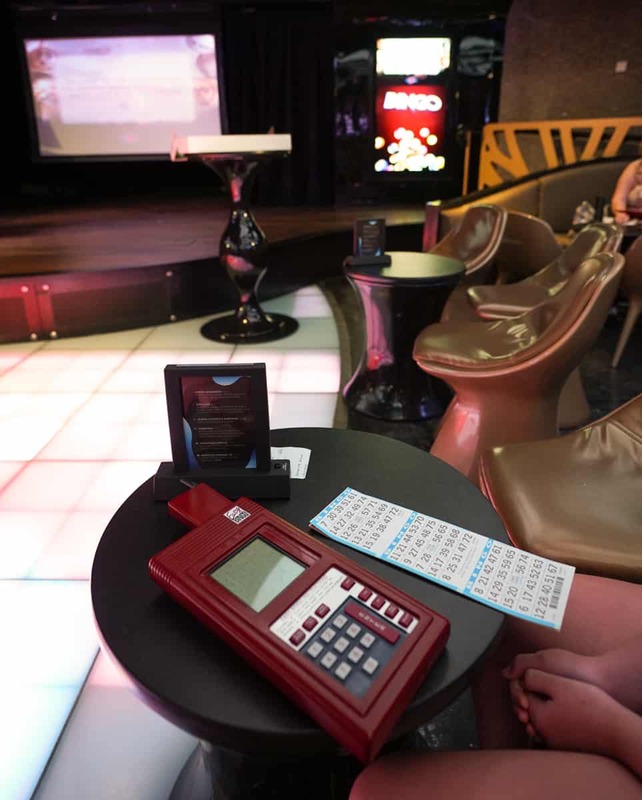 Bingo is daily activity on the cruise we try to make each day. It’s the only form of gambling on the ship, and the prize gets bigger as the cruise progresses. Bingo is a Disney version of gambling my whole family gets really excited about. It’s an additional fee per card you wish you to play. There are four games per event. and the staff lead the games with humor and energy, and my family loves it. Cost: $30/6 paper cards, $40/24 electronic cards, $50/48 electronic cards. 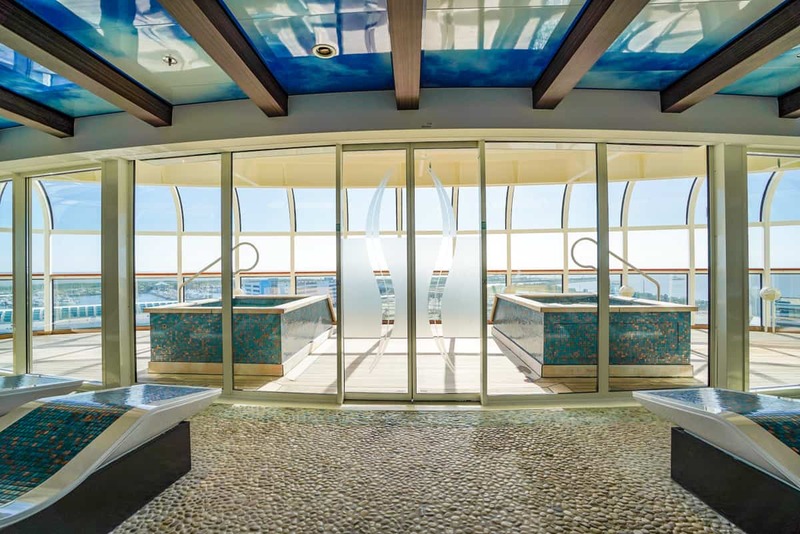 The Satellite Falls pool on deck 13 has a lounge area protected from the wind by glass windows. 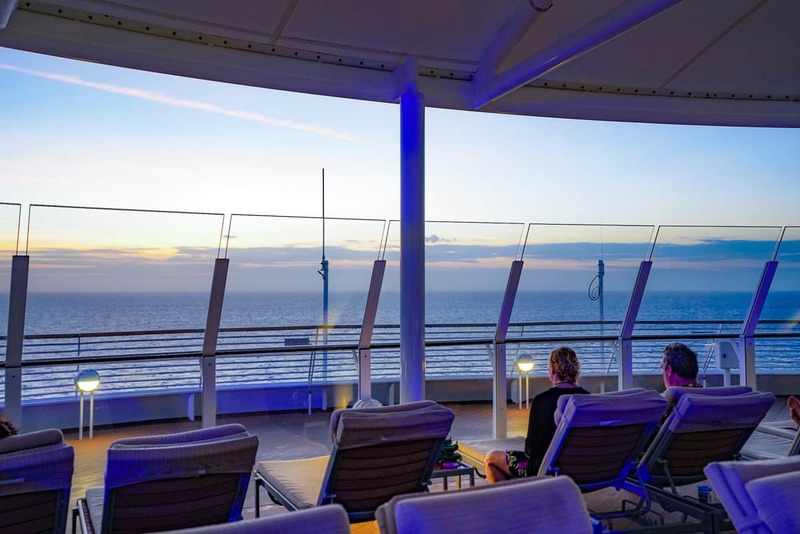 Tucked within the adult-only section and Quiet Cove pool is the perfect place to watch the sun rise when the ship is sailing South. Those glass walls are very nice to shield from early morning winds. Many adults start their morning here as a ritual. It is peaceful but can be exceptionally windy. Depending on the season, this is conveniently near the Cove Cafe for a rich espresso or latte before, during, and after. You can find me at the Cove Cafe each morning for gorgeous lattes and warm croissants. After the sunrise, the Cove Cafe opens to serve outstanding coffee drinks. These are not included in the cruise but are absolutely worth it for your morning joe. There are croissants and baked goods that are complimentary. There is a frequent buyer punch card, too. 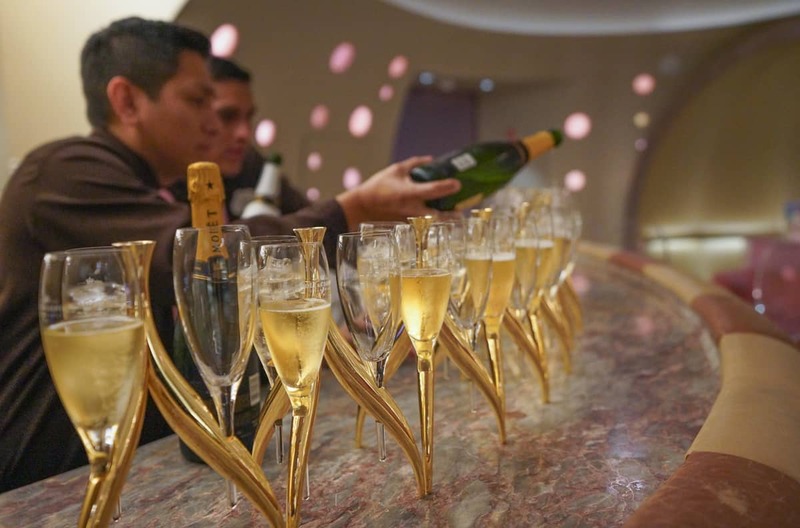 Even a three-day cruise with two cups a day earns enough punches for a free drink. Cost: Most drinks range between $5 and $6. 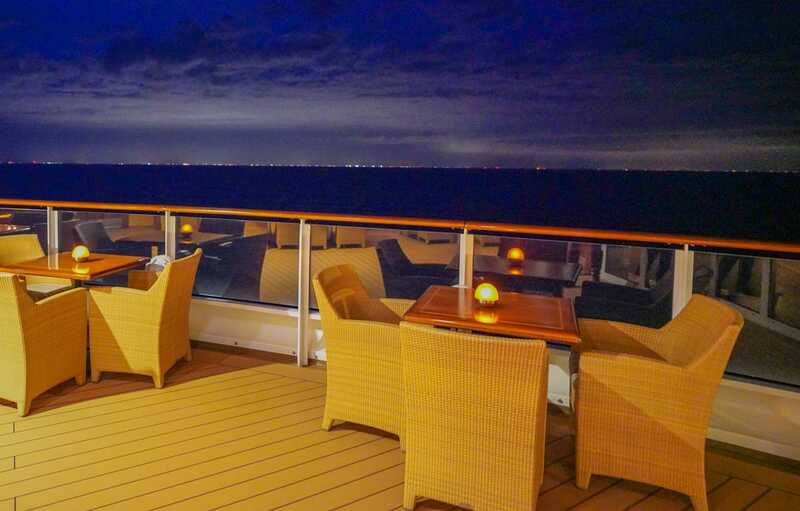 If booking a tasting menu dinner at Remy doesn’t seem to fit your schedule, I suggest you head to Meridian lounge in between Palo and Remy on the 12th deck. Meridians Lounge nested in between Remy and Palo offers an elegant and quiet place for a cocktail. It’s almost always empty, and it’s a fantastic place for an elegant cocktail either in their leather bound lounge or outside on their private balcony. Meridians has a balcony for sunset drinks. 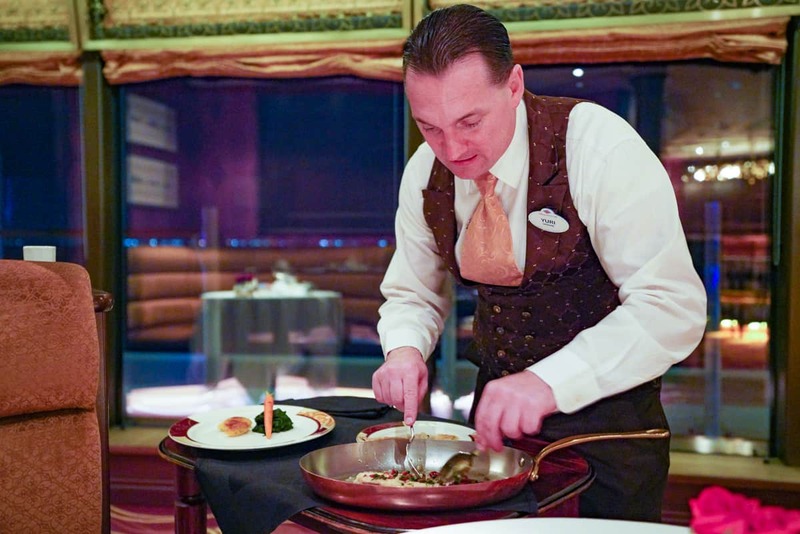 It’s an easy way to sample the level of service the guests receive in the premium dining area on the 12th deck. They serve elegant signature cocktails like the Gin Garden with Hendrick’s Gin, Fresh Muddled Cucumber, Freshly Squeezed Lemon Juice, and Sprite. Or try Le Grand Bleu with Grey Goose Vodka, Grand Marnier, Blue Curacao Liqueur, Freshly Squeezed Lime Juice, and Taittinger Champagne. Cost: Signature cocktails are $9.95. 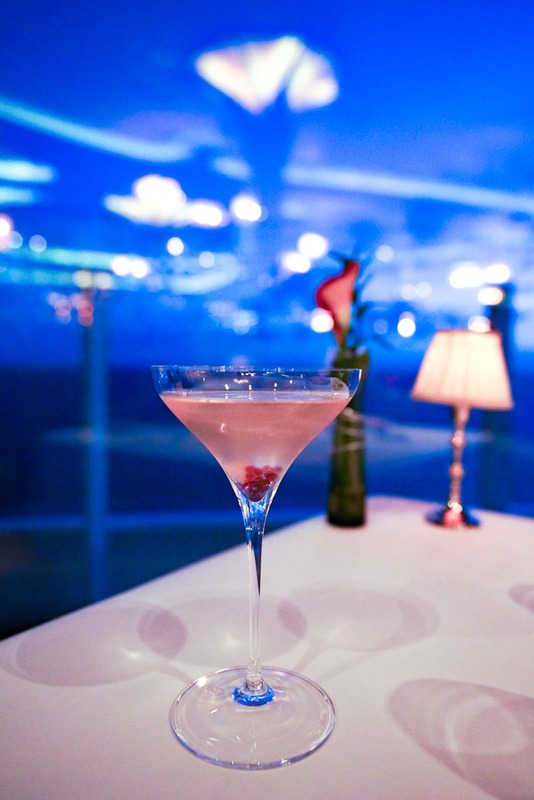 Room service is complimentary on board, and guests just pay gratuities or any fees for alcohol. 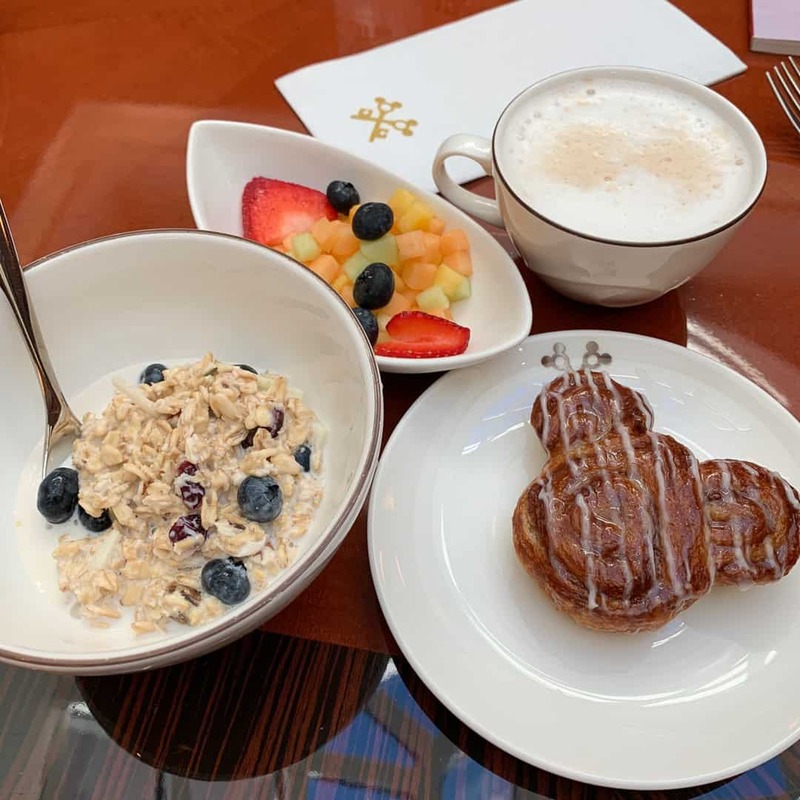 It is a must to pre order continental breakfast to your stateroom in the morning so that everyone in the family has healthy blood sugar levels while trying to get out the door. 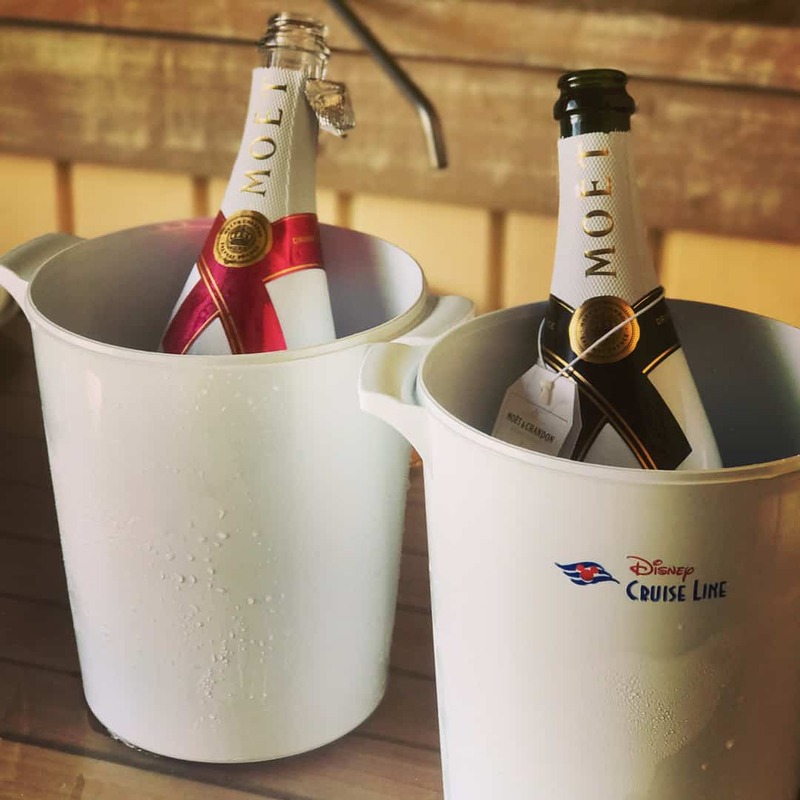 Luxe Recess contributor Shay brings her mini Prosecco bottles on board to make mimosas on her verandah with the complimentary orange juice while her kids sleep a little longer. Cost: $7 for a single serve bottle of Prosecco (BYOB) and complimentary room service less the service fee. 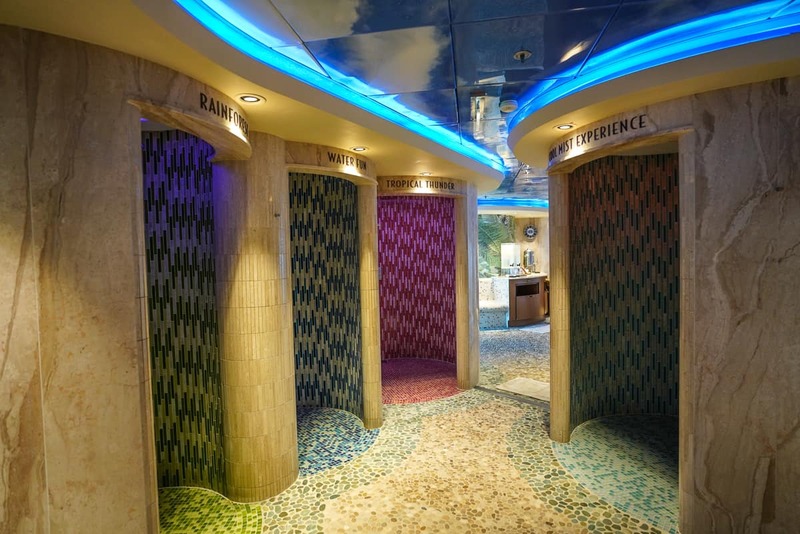 My family loves spas, so we the enjoy the Senses spa on the ship as much as possible. I had imagined that spa services might book up, but in fact they’re very easy to book on your first day cruising. The Senses Spa is as large as a full sized-resort spa with a gym and fresh juice and smoothie bar, too. The concierge hosts can book treatments throughout the cruise for concierge guests. But there’s also a spa hostess who takes reservations alongside a team from Palo and Remy on Embarkation Day. 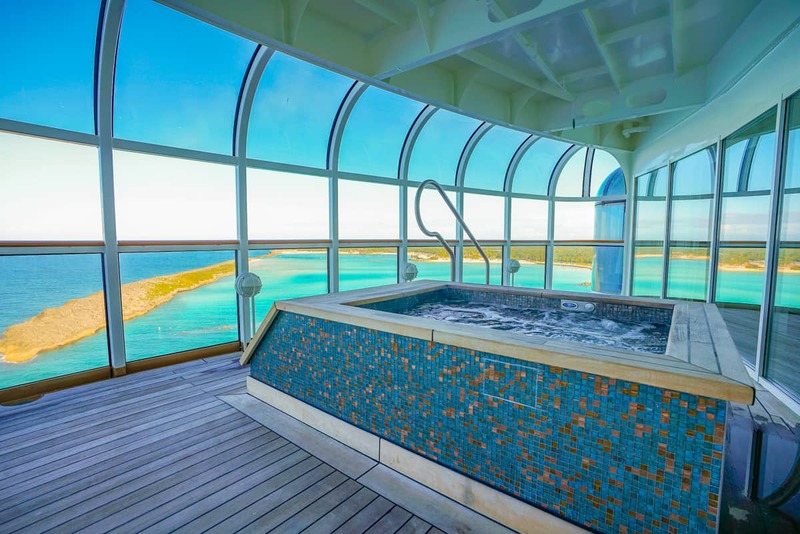 The cruise usually promotes a special treatment at a discounted rate. It’s typically a hybrid treatment that includes a mini facial and massage. Book it. It’s a great introduction to the spa services, and one can book more massages and a blowout on a subsequent visit. I like booking a first morning treatment while the ship docks in port. The salon is excellent, and my husband even got a fantastic haircut once. My teen daughter loves the nail spa and her cruise treat is a mani-pedi or a mini-teen facial. 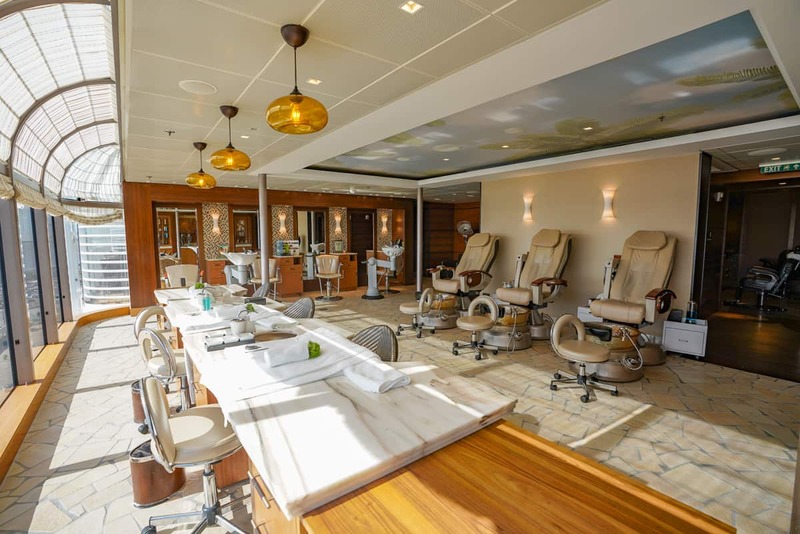 The salon at the Senses Spa is great for a blow out or haircut on the Disney Dream. The big splurge from the Senses Spa is the couple’s villa. Couples have treatments side by side and can then spend 75 minutes in their private hot tub on the suite’s verandah. Cost: $150 for the Embarkation Day special, and the Couple’s Villa experience starts at $475. 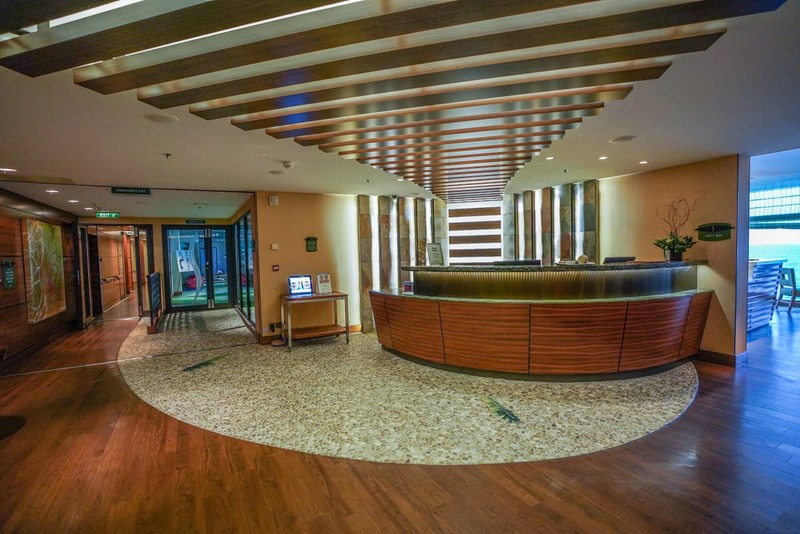 Even if spa services aren’t your thing, everyone raves about the Rainforest Pass—including me. 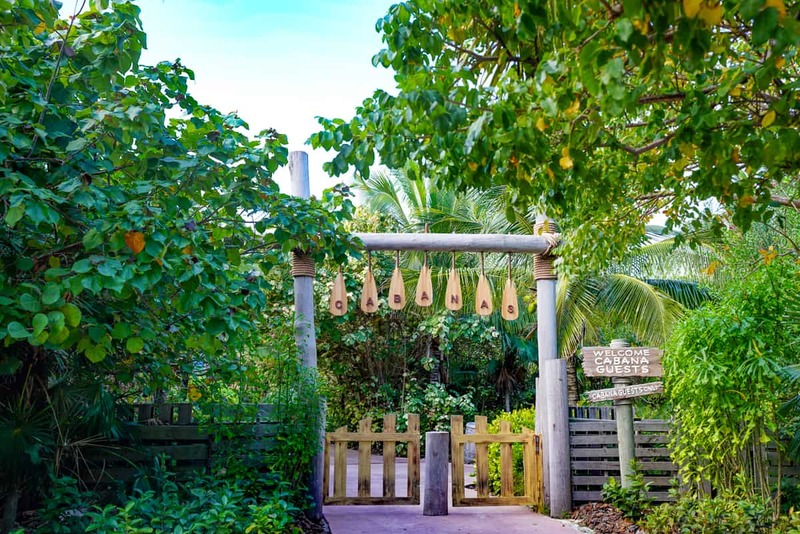 The Rainforest Pass can be purchased in advance on line, and it provides access to a special hydrotherapy area that includes a series of specialized showers. The Rainforest Experience includes access to this coed hydrotherapy area. But the real allure is the room with two hot tubs overlooking the ocean and fantastic heated loungers. I’ve been known to fall asleep on those. 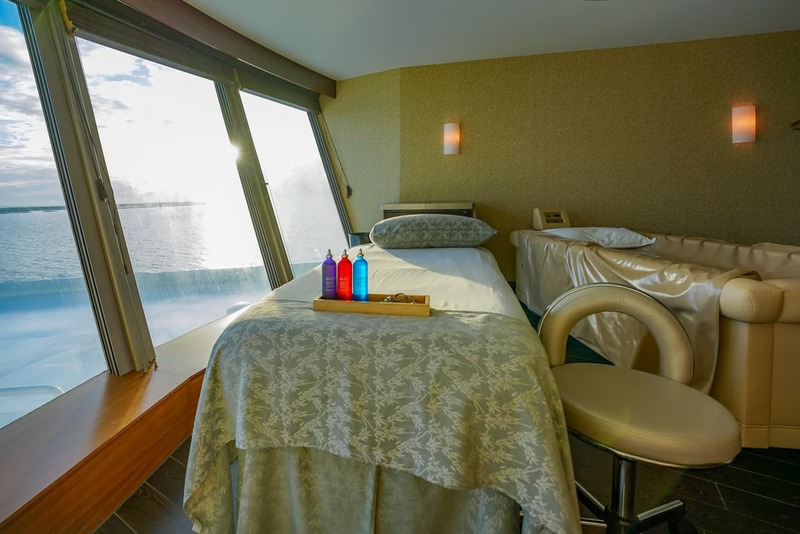 The Rainforest Pass is a great way to have access to the spa for the duration of your cruise for less. The heated loungers and hot tubs with views are the real draw of the Rainforest experience. Cost: A Day Rainforest Pass for one day is $16, and it is best to order it by phone in advance of your cruise at 1-800-601-8455 from the gift and amenity desk. Buy the largest plan first because it goes so much faster than you think it will. It will save you money in the long run. One package lasted fourteen minutes for me. So many devices have background activity that drains data and consumes your package quickly. You can follow the steps here to try and disable these settings prior to going online. 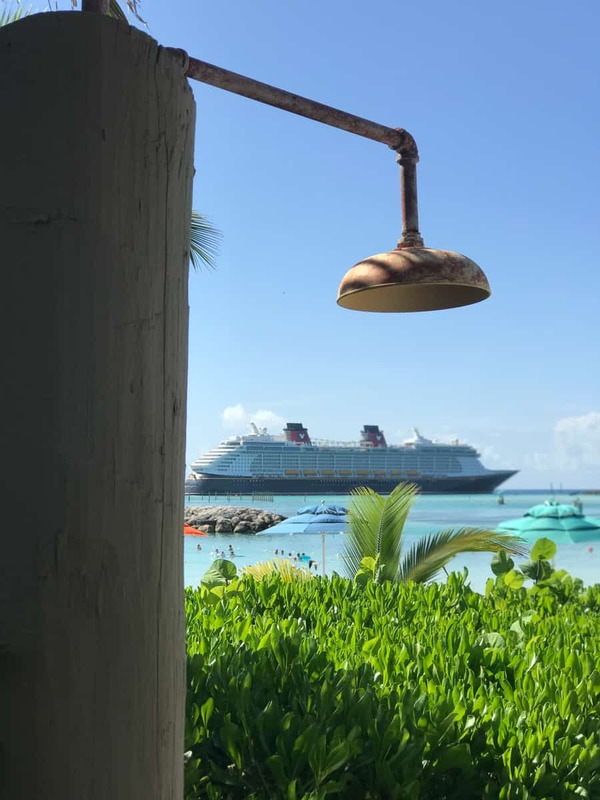 The biggest splurge on a Disney Cruise is a cabana on Castaway Cay. Why? Well, you basically have to book a concierge cabin in order to reserve one. Family Beach cabanas offer shade, privacy, and a fantastic view of the ship. Only 20 cabanas line the Family beach, and Concierge guests take most by the time their booking window opens at 120 days. Sometimes a few are left at 90 days for Platinum guests, but after that, a cancellation is your only hope. They do happen. 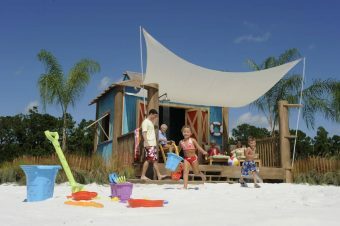 If you are traveling without children, there are four more cabanas on Serenity Bay, the adults-only beach. Cabana guests eat lunch at the same restaurants as the rest of the cruise passengers. What’s included in the cabana cost? 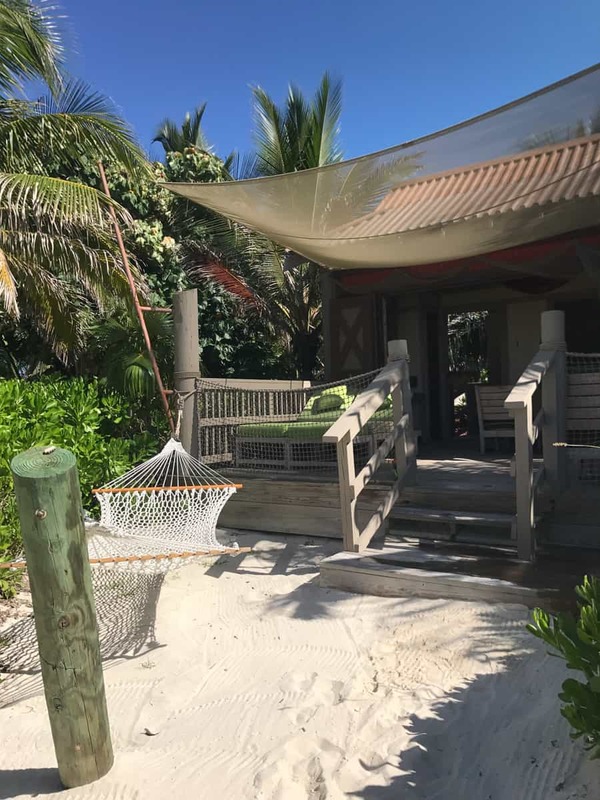 The cabanas offer a hammock, outdoor shower, lounge furniture, a mini fridge, and a safe. They also come with unlimited bottled water and sodas, fresh fruit, and chips. Guests can pre-order beverage packages of wines, beers, and champagnes. 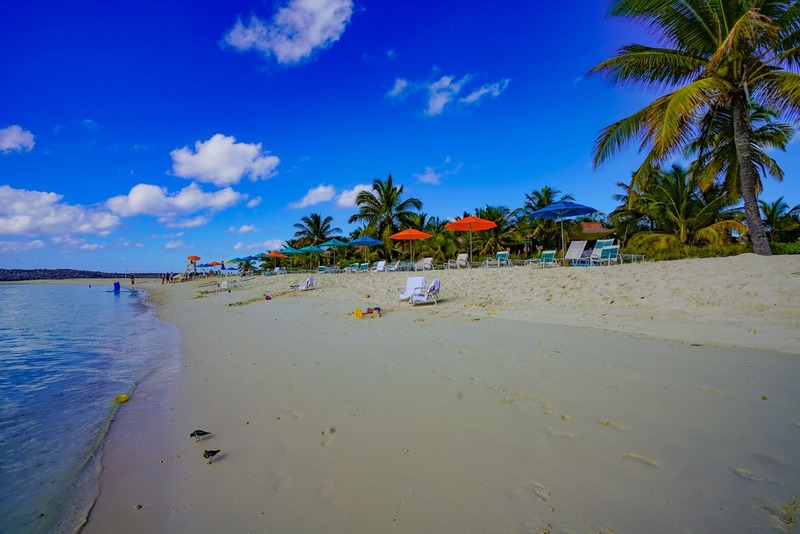 The family cabanas include a few beach activities like snorkeling equipment, floats, and bike rental. 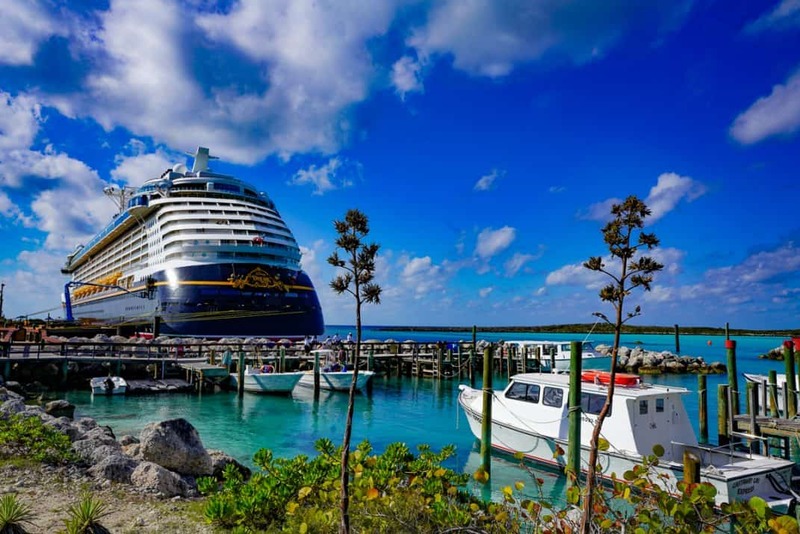 The Disney Dream and Fantasy are large ships, and the island beaches don’t feel exactly secluded or serene. 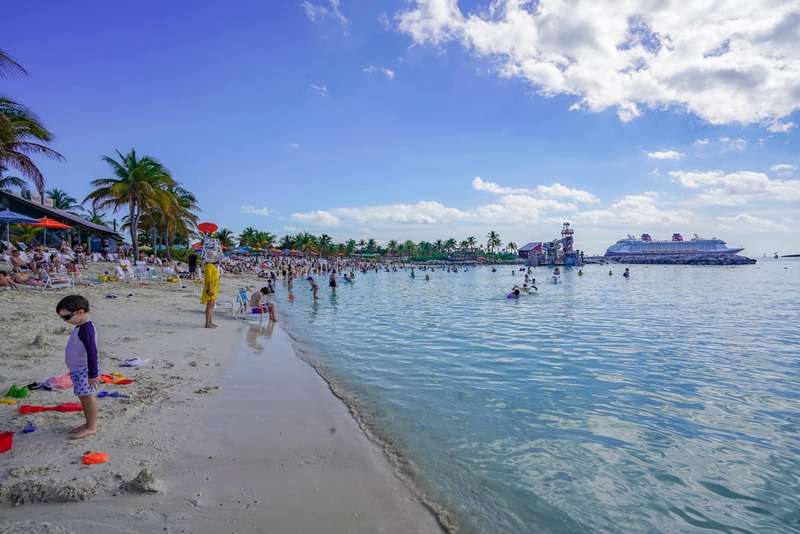 The Castaway Cay beach for cabana guests. The beach for everyone else. 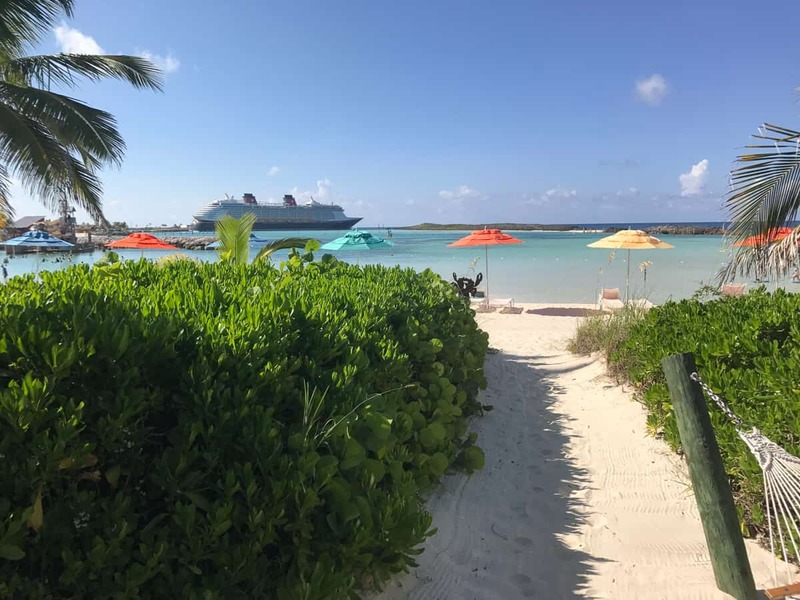 The biggest benefit: Cabanas provide a far more secluded private beach experience on Castaway Cay that you can see in the picture. Cost: $499 for Serenity Bay cabanas and more for cabanas on the family beach. It is very easy to rack up a large bill at check out on a Disney Cruise—even when the fare includes so much. 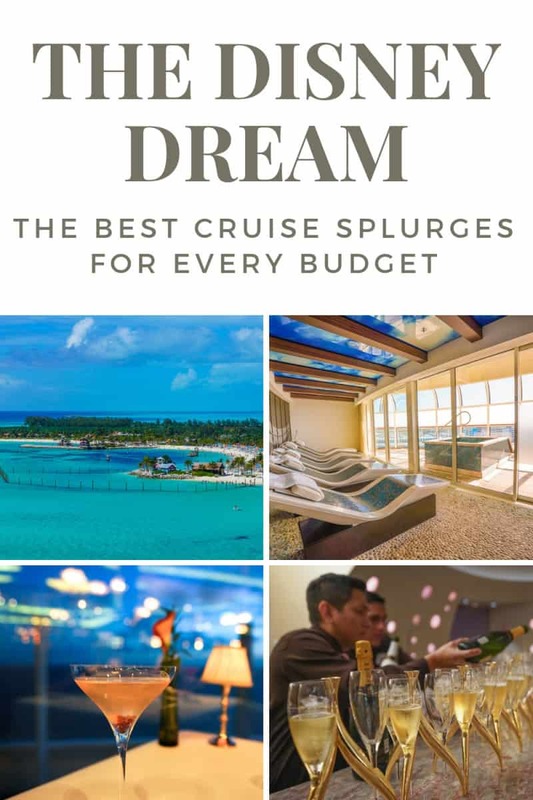 I hope this guide helps you determine what may or may not be worth it for your cruise budget, and if there’s no budget, I hope you see how fabulous you can make the experience!